Well how about this for an early Christmas gift? Clearly we’ve been good this year (contrary to what you think, MUM), because approximately six weeks before production versions are due to pop out from the factory, we’ve just received three prototype pedals from Shimano – including the brand-new Deore XT flat pedal. 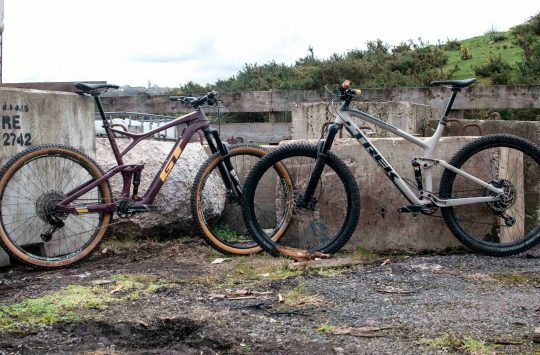 You might recall that we first got a look at these back at Fort William in June (you can check out the first look story here). However, those were all samples that were kept guarded underneath clear perspex because they weren’t exactly finished. What we’ve got here then is a much closer look at what you’ll be able to buy in early 2018. 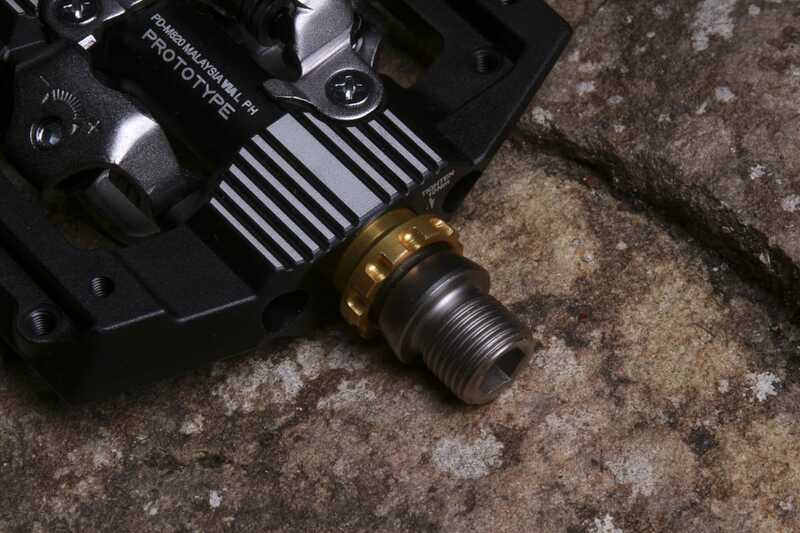 There’s a brand new Saint SPD pedal that presents a new gravity option for those riders who like to clip-in, and there’s also an all-new thinner Saint flat pedal that at £129, is designed to go head-to-head with other premium flat pedals such as the Gamut Podium, DMR Vaults and Hope F-20 flats. 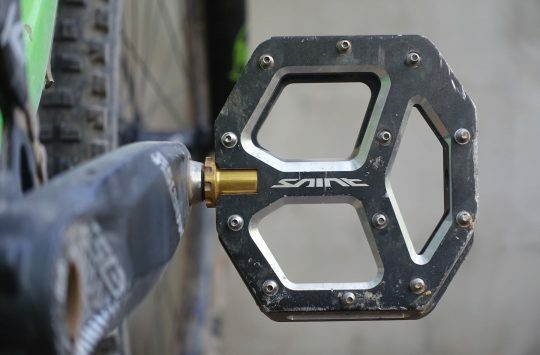 And for the first time ever, there’s now a Deore XT flat pedal that offers a similar platform and pin system to the Saints, but at a good 50 quid cheaper. The pedals we have here are stamped with Shimano’s ‘Prototype’ logo, but we’re informed that these are very close to production versions. One thing you’ll note is that the pins shown on the flat pedals are actually shorter than what will come stock (2mm compared to 3mm and 5mm options), while the Saint SPD pedals are shown without pins altogether. Deore XT flat pedals – for the first time ever! These are available in two different platform sizes to better fit different shoe sizes. 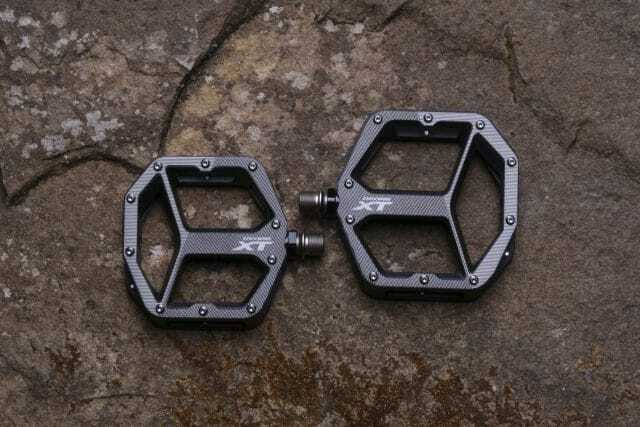 Shimano has of course offered XT pedals before, and the current XT Trail pedals are some of our favourite and most reliable clip-in pedals going. However, this is the first time that Shimano will be offering flat pedals bearing the XT name. Using a large bodied alloy platform, the XT flats are equipped with 10 adjustable pins on each side, and you can utilise either 3mm or 5mm pins depending on how much grip you want – and where you want it too. They’re also available in two different platform sizes: S/M and M/L. The platform increases by 10mm in length and width for the M/L size, which makes it more suitable for those with larger sized shoes. 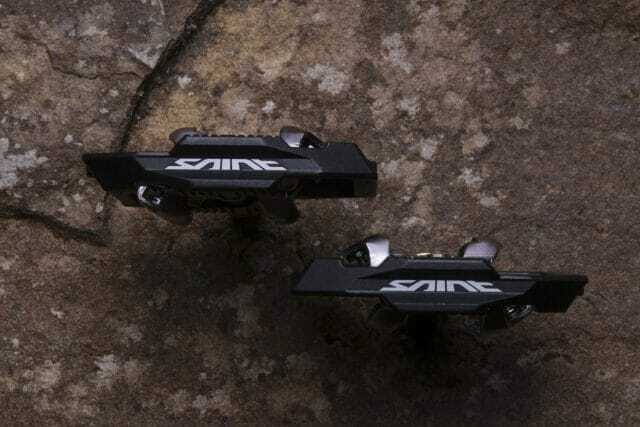 The new Saint flats are completely changed over the old MX80 pedals. The Saints get 12 pins per side (compared to 10 per side on the XT) for more traction. 3mm and 5mm pins will be available. 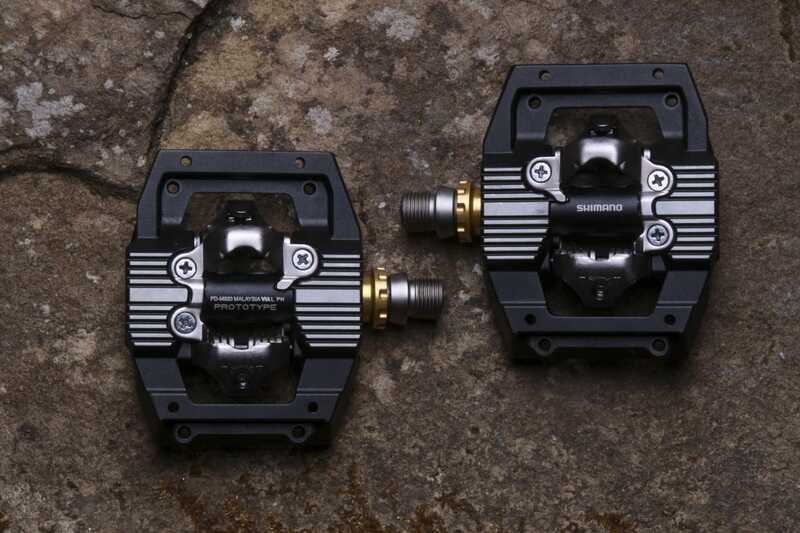 The M828 Saint flat pedals take over where the MX80 flat pedals left off. Everything is different though – there’s a new bigger platform that measures a huge 110mm long x 105mm wide (compared to 90mm x 95mm on the old Saints), and Shimano has engineered an even stronger cromoly axle that’s designed to resist the heaviest stomping dished out by downhill racers and riders. That 16.4mm centre thickness is maintained all the way, with no annoying bulge around the axle like the old MX80 flats. 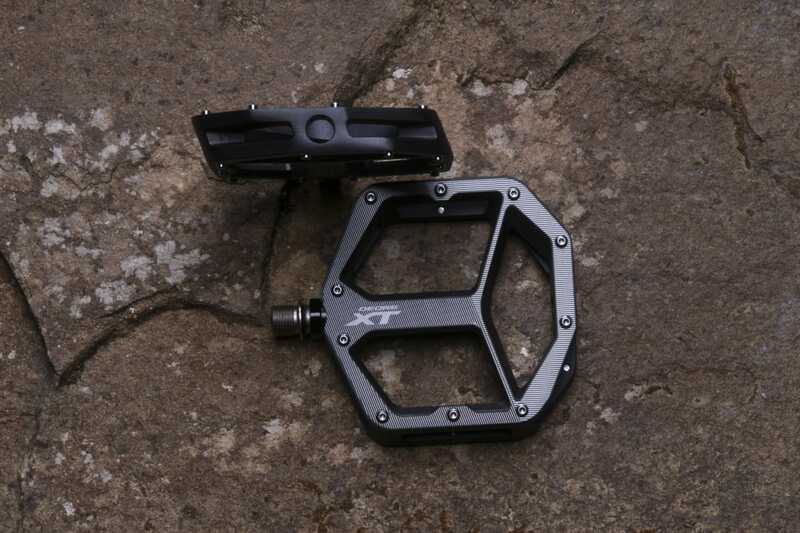 Compared to the XT flats, the alloy body on the Saint pedals puts more surface contact underneath the shoe. 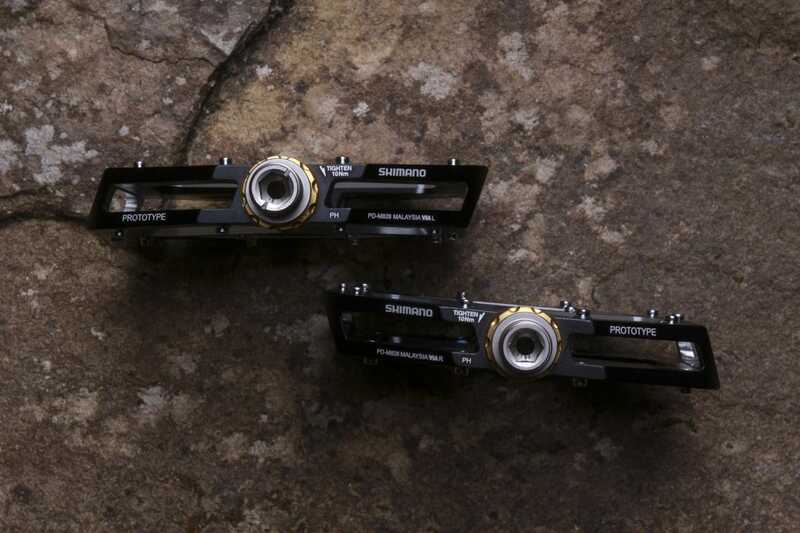 Thanks to some liberal machining though, Shimano has been able to keep the weight very similar between the two. The Saints are also thinner, measuring at 16.4mm in the centre. This isn’t as thin as some other flat pedals out there, but crucially this thickness is maintained all the way from inside to outside – unlike the old Saints that had a bulge in the middle of the platform. For traction, there are 12 pins per pedal, per side, and you’ve got the option of 3mm or 5mm pins. 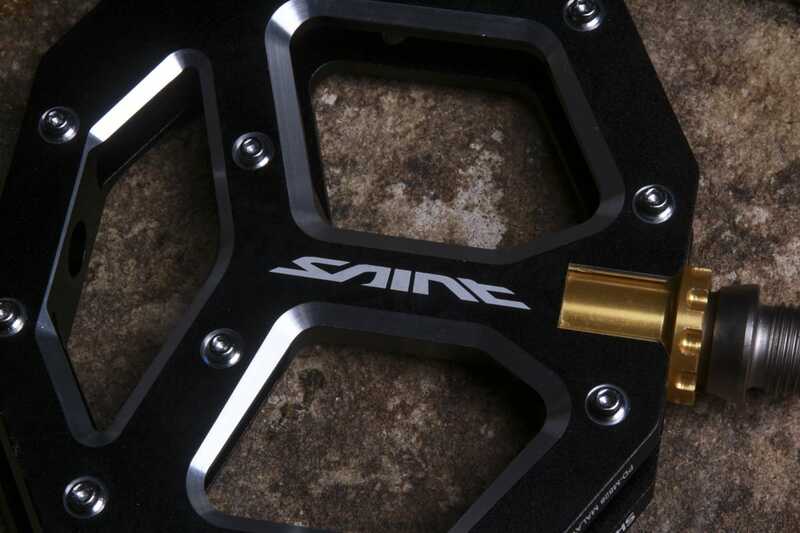 Also new is the Saint SPD pedals – the first of their kind. 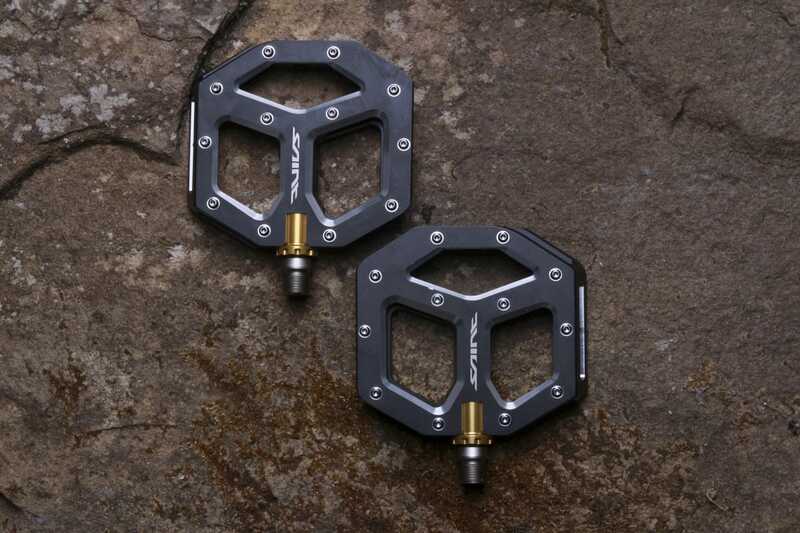 The Saint SPD pedals use a forged alloy body that is bigger than the current Shimano Trail pedals. While the healthy debate around flats vs clips carries on, it only takes a brief look at the upper echelons of XC, Enduro and Downhill racing to find out which is used more by the pros. Aiming to cater to those World Cup level riders (that up until now have only had the DX 647 pedal as an option from Shimano), Shimano has developed a new Saint SPD pedal. Essentially connecting the dots between Shimano’s Trail SPD pedals and the Saint flat pedal, the Saint SPD features a robust forged alloy body that measures in smaller than a flat pedal, but still provides a much larger contact patch for the shoe to sit on while clipped in. Inside is a tough cromoly spindle, and serviceable cup ‘n’ cone bearings shielded by labyrinth seals. The clip mechanism is the same SPD system that is already well proven with Shimano’s existing pedal range, which means you’ve got adjustable tension to alter how tightly it holds onto your cleats. Inside you’ll find the same high-strength axle and bearing system used on the flat pedals, so it’s huck-to-flat ready. Stay tuned for further updates on the new pedal options from Shimano, and watch out for our clip-in pedal group test in the next issue of Singletrack Magazine. For more information in the meantime, head to the Shimano website. The best thing about the old Saint pedals was the price. That’s gone out the window with these! 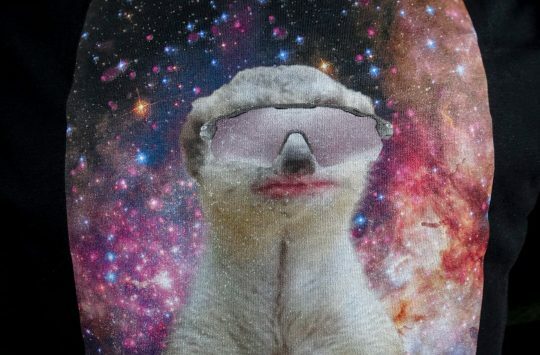 Wow those look….er…crap. XTs look as thick as a DMR V8 and the Saints look to be an awful shape. The Saint SPD’s are nice, got them on my bike. Interesting use of pins that are not really very pin-like..